Photo credits go to Harold Cartegena. The Philippines is known for their colorful festivals and Iloilo City’s Dinagyang Festival is just one of the many feasts celebrated in the country. 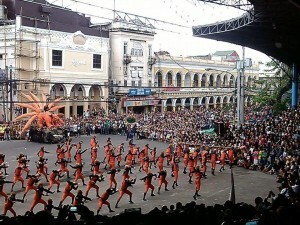 What makes this year’s Dinagyang festival more special is that a large number of Naruto Uzumaki’s (うずまき ナルト) Shadow Clones have come from Konoha (木ノ葉隠れの里) to Iloilo City – complete with the Kyuubi (九尾)! 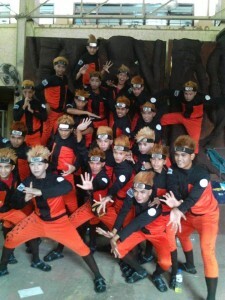 The Naruto Shippuden (-ナルト- 疾風伝) inspired street performers are members of the TRIBU PAGHIDAET – a dedicated group of students hailing from La Paz National High School, Iloilo City. Named after the Lady of Peace and Good Voyage who the Lapazenians believe to bring powerful winds to their sails, the group has been formed in 1992 and has been present in the Dinagyang Festival openings ever since while bagging championships in the years 2002, 2003, 2008, 2009 and 2010. During the Opening Salvo, onlookers were hooked on the multitude of Narutos with their gigantic Kyuubi. Tribu Paghidaet’s performance features Naruto and Tobi (トビ) duking it out in the front while Naruto’s Shadow Clones enter the scene. Their spectacular performance lasted for more than four minutes and the crowd loved every second of it. Otakus from all over the Philippines were nothing short of awestruck – Tribu Paghidaet’s performance and theme instantly became viral across the Philippines and will soon be known throughout the world. Check out more photos from the festival on their Facebook page and don’t forget to give them a Like! Jed Patrick E. Mabilog has also shared his photos on Facebook taken during the event. Want to check out their presentation? Click this link here. The images and video used in this article are taken from and are credited to LaPaz National High School’s Facebook page, AnimePH and Dinagyang Festival, (Iloilo Philippines).